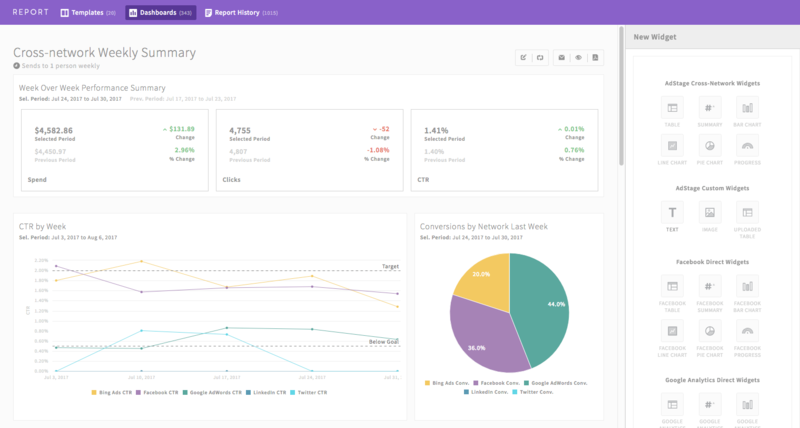 Report, the newest product in the AdStage suite, is a great way to organize and make sense of your advertising data with visually striking, shareable graphs and tables. Step 1: Click Create Dashboard. Once you have saved your dashboard name, you can add a default date range, default data source, markup, and logo. Click save, and you will land in an empty dashboard. Step 2: Start building out your dashboard by adding widgets. Step 3: After you've added widgets to your dashboard, you can share or view your report by clicking Share, Web View, or PDF. Check out our video walkthrough of Report here. Don't know what kind of report to build? Start with one of our Report Templates.